I'm back! Took a break from blogging and now I'm back to talk about a recent color love. A while back, I complained in pretty much every blog post that my lips were acting up. I think I was able to narrow it down to the Kylie Cosmetics Liquid Lipsticks but I'm not 100% sure. Ever since I've stopped using those, my odd lip reaction stopped. I'm actually kind of sad about it because they were pretty good and they introduced me to one of my favorite shades - Pumpkin. It's not available on their website anymore, but imagine a dark pumpkin shade with some brown in it. I still sometimes wear the lip liner since I'm not allergic to that though and so it's not a total loss! Even so, this whole thing sparked my love and hunt for the perfect dark pumpkin orangey brown shade and I've found quite a few favorites. Btw, all of these shades are some kind of variation of the shade I talked about earlier and so I'm not going to touch on it too much for the rest of the post except to explain the differences. The NARS Audacious Lipstick in Linda is the newest addition to my collection and it definitely makes me feel a bit luxe because of the heavy and chic packaging. It's described as a caramel on the NARS website and there's a stronger orange tone to it than brown. Unfortunately, it doesn't last that long on me. It does feel super comfortable and fades so nicely though so it's not a loss. I just prefer some of my other picks more because I don't have to touch up as often or get worried about smears. NARS Linda retails for $32 and can be purchased using the links below. It is limited edition though and so grab it while you can if you like the shade and formula! The Melt Cosmetics Matte Lipstick in Mum is the only traditional matte shade of the bunch and it's probably the shade I wear the most often. 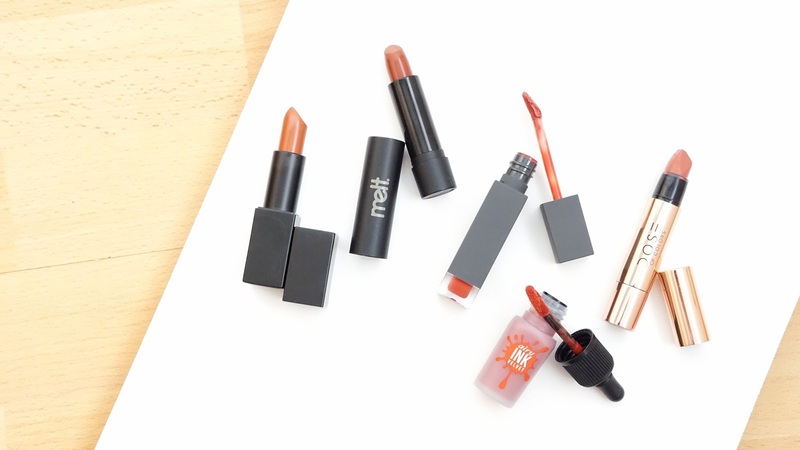 On the Melt website, this shade definitely looks like a brighter orange but it's more muted/darker on my medium skin tone and slightly mauvey lips. 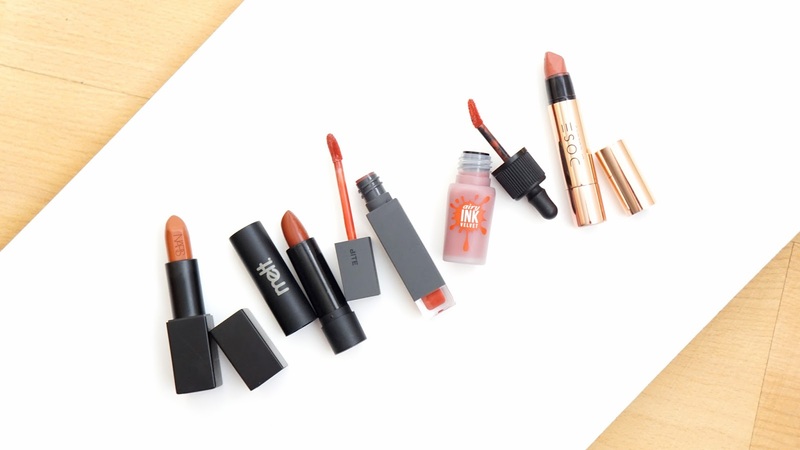 Out of the five shades, I would say "burnt orange" does describe this shade pretty well. It's not as creamy as Cinnamon Twist and Linda and so it tugs on the lips a bit more, but it's still comfortable. Melt Cosmetics Mum retails for $19 and can be purchased here! 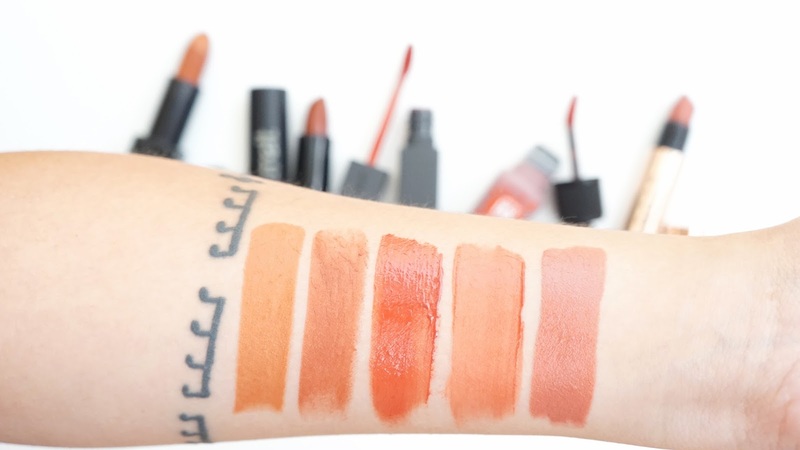 The Bite Beauty Amuse Bouche Liquified Lipstick in Purée is probably the most orange of the bunch and while it's not bright, it's something I do enjoy making the focus of my look with maybe a winged liner and a stronger highlight. It's more red than the other four shades with a slightly glossy look. 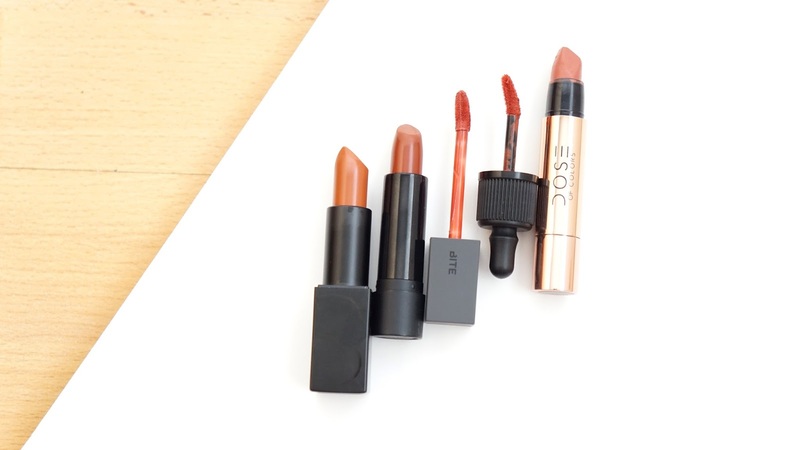 Bite Beauty is one of my favorite lipstick brands and the Amuse Bouche Liquified Lipsticks does not disappoint. My preferred finish is more on the matte / satin side, but a quick blot of this lipsticks makes it perfect. Pare also looks perfect for this color palette, but I haven't swatched it yet to compare. Bite Beauty Purée retails for $24 and can be purchased through the Sephora website here! The Peripera Ink The Airy Velvet in 6 It Brown Orange has a moussey formula and feels light on the lips. It has a thin buildable, but not sheer, formula and so it'll be great for the gradient look as well. The finish is on the semi-matte / velvety side and lasts for a long time while still feeling comfortable. The Dose Of Colors Satin Lipstick in Cinnamon Swirl has a satin finish and so it's comfortable to wear, but I hate the packaging. Both my original and replacement Cinnamon Swirl arrived broken and even when I tried to fix it by melting and melding it back together at the base, it still kind of wiggles and slightly scrapes on the sides. But besides my frustrations with the packaging, it's a really good formula. It feels light on the lips while still being pigmented, fades gracefully, and is moisturizing. It's also more pinky / coral as well and so I can see this also being a spring lipstick shade. DOS Cinnamon Swirl retails for $19 and can be purchased using the links below! Burnt orange is definitely a love for me and I would love to see more companies coming out with their own version. Let me know what's your favorite lip color below and I would love any recommendations as well since lipsticks are and will always be my favorite makeup product!